Being Retro: Ughhh, and Ughhh Some More! Have you had the chance to take a look at my ebook "Chatterbox", the response has been great I am happy I could share it with you. 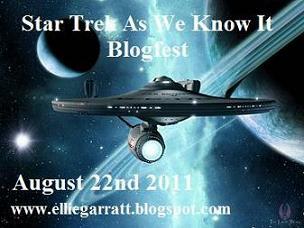 So it's Saturday and I am heading out to the farm, even though it's raining I am getting ready for my big little part in Ellie's "Star Trek As We Know It Blogfest (August 22nd)" and if you know I loves me some Star Trek. I won't be posting my Star Trek stuff here, nope it will be on my "http://twothumbseightfingers.blogspot.com/" site cause... well I can. Anyway how am I ever going to get you over to that site, see the interviews, reviews and cool stuff there... if you don't know it's there. So put your Spock Ears on and take a look at my Trek on Monday, then stop over and check out the other entries on Ellie's site... you will not be disappointed. How fun! Have a well-earned blast! Glad people are digging Chatterbox! And I am all ready for Ellie's blogfest.